March For Right of Return in Chicago | Fight Back! 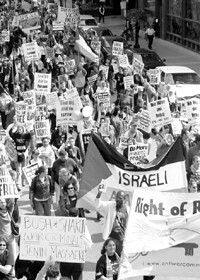 Chicago, IL - The streets of downtown Chicago were filled with chants of "Free, free Palestine! 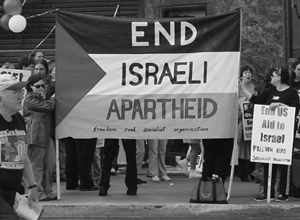 Democratic Palestine!" on Sunday, Sept. 29. More than 1200 activists took over city streets and rallied at the Federal Plaza to demand the right of return to Palestine for all Palestinian refugees. The national demonstration was organized by Al Awda to commemorate the 2-year anniversary of the second Intifada - the uprising of the Palestinian people in the occupied territories against the apartheid-like conditions under which they live. There was also a strong message of "No war on Iraq," making this rally the largest anti-war protest in Chicago since November 2001, when the U.S. attacked and occupied Afghanistan.